To boot a 64bit operating system on a nested ESXi host, it is necessary to edit a config file. To do so, enable SSH on your ESXi host and connect to it using e.g. putty. Done? 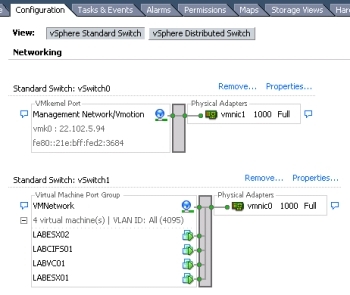 Now it is time to connect to your ESXi Host via vCenter Client for the first time! If you select the configuration tab you will see the warning “The ESXi host does not have persistant storage.”. One thing to note is that your system CPU should support EPT if it’s Intel or AMD RVI for MMU virtualization in order for this to work!